Philmac specialise in manufacturing, distributing, specifying and supporting the sale of key mining pipeline connections including the specialised Safelok mining compression fittings, pressure reducing ratio valves, industrial valves, Electrofusion couplings, spigot fittings and mechanical couplings. As part of the Aliaxis group of companies, Philmac have access to world leading innovative specialist mining fittings from across the globe. This means that Philmac is able to bring the world’s best specialist mining connections and system solutions to your fingertips, including thet Friatec range of Electrofusion fittings, the Durapipe ABS system, FIP industrial PVC ball valves and Viking Johnson mechanical couplings. The Safelok® compression fittings are specifically designed to offer high leves of safety for mining applications. The fittings feature Philmac's patented Slide and Tighten technology, which allows installers to simply slide the pipe into the fitting and then tighten the nut, negating any need for pipe preparation, forcing the pipe past an o-ring or fiddling with loose components. The Safelok® compression fitting with its Slide and Tighten technology differs from other compression fittings in the market place, because the tightening of the nut compresses the seal in the fitting. In practical terms, this means that as the nut is backed off, the seal is released well before the fitting releases its grip on the pipe. Once the seal is released, if the line is still energised, a loud sound will be heard, offering a warning to the installer to re-assemble and switch off and bleed the line. This is a primary feature of the Safelok® range. Australian made for Australian conditions - don't ask for a fitting, ask for a Philmac. Providing a safe workplace is the obligation of every employer, no matter the industry. There are fewer industries on the planet that are as demanding on pipelines as the mining industry, and this can make providing a safe environment so much harder. Recognising the tough conditions in the mining industry, Philmac has developed and is proud to introduce a truly unique compression fitting for the connection of polyethylene pipes – Safelok®. Made from a special formulation of polypropylene for unrivalled strength and performance, and with its distinct orange nuts for extra-high visibility, Safelok® truly is the safest compression fitting on the planet. Philmac strongly recommends that fittings should never be disconnected on a live air line. However in the event that work commences on an air line before the air supply is switched off, the use of Philmac Safelok fittings will ensure that a warning is given to the user that the line is live. The user can then switch off the air supply and continue working on the line in a safe manner. When the nut is tightened on a Safelok fitting, not only is the end of the pipe secured, but it also fully compresses the o-ring and creates a seal. This means that if a user mistakenly works on a live air line and starts to loosen the nut on a Safelok fitting, there will be a loud release of air at the point when two threads are exposed. Importantly, the grip will still be retained on the pipe so the user can take action – retighten the nut and switch off the air supply – preventing an extremely dangerous situation from occurring. Safelok® fittings are supplied with orange coloured nuts. In the dark conditions that exist underground they stand out when light is shone on them reducing the chance of accidental collision and making identifi cation and therefore maintenance easier. Safelok® fittings are made from a high grade of polypropylene to provide signifi cant resistance to impact. In mining conditions risk of impact is always high so the fitting must be tough and durable to provide a long life. At the same time if in the unlikely circumstances that the material should fail due to impact, it will result in a ductile rather than a brittle failure. This means that there is no risk of injury through a fitting explosion when used in a compressed air application. No pipe preparation is needed and no force is required to push the pipe past the seal, so installation couldn’t be faster or easier. Simply insert the pipe into the fitting until the first point of resistance is felt and then tighten the nut until it butts against the flange of the fitting body. This means that even making a 110mm joint with pipe hanging from the tunnel roof becomes a one man job. The flange on the body of the Safelok® fitting provides a visual stop to indicate when the nut is fully tightened. This removes any uncertainty from the installation process. Although dis-assembly of the fi tting is not required for installation, if the nut is removed there is no danger of losing components as they are all retained within the nut. Losing components in the dark becomes a thing of the past. Standard compression fi ttings are supplied with nitrile seals which fail when they come into contact with acids. Safelok® fittings are supplied with EPDM seals which means that the fittings can withstand a wide range of chemicals without having to switch components. The fitting has been designed to minimise pipe twist as the nut is tightened. Maximum pipe twist is approximately three quarters of a turn compared to one and a half turns with many other fittings. Pipe twist can impact on not only the connection you have just made but also on the connection at the other end of the line. Safelok® is manufactured from lightweight, high performance thermoplastic materials with outstanding impact, chemical, corrosion and UV resistance. Safelok® fittings are pressure rated to 1600 kpa (PN16) across all sizes. Built to withstand the toughest conditions to ensure longevity and durability, Safelok® fittings have a 50 year+ design life. The Safelok® range is comprehensive; straight and reducing couplers, tees, elbows, threaded connectors, end caps, flange adaptors and shouldered adaptors ranging from 63mm to 110mm. Please contact your local Philmac representative for any enquiries regarding spare parts. Please find below a complete listing of the Philmac Safelok Compression fittings for metric polyethylene pressure pipe. This is also available as an excel file for download. The Philmac Blue Handled Ball Valve is ideal for the control of water within a pipe system for use above or below ground. The Philmac ball valve offers 1600kPa pressure rating with the added benefits of a shouldered spindle and double o-rings. This Australian made champion still retains the key values of being easy to operate, compact and offering high flow operation. Made in Australia for Australian conditions, the valves are available with the new ergonomic blue handle or can be assembled with a purple handle for recycled water applications. All threads are BSP (Whitworth form). 1600 kPa (232 psi) or 16 bar. Philmac recommends sealing threads with PTFE tape. Other approved sealants for plastic materials can be used providing the sealant does not enter the valve where it may cause damage. Connection is cold water (less than 20°C) rated. * Denotes pressure loss too small to accurately measure but can be assumed to be 5 kPa or less. Philmac’s blue handled ball valves are primarily designed to convey water. However there may be occasions where the water contains chemicals and/or alternative fluids need to be controlled. The following table is provided as a guide only for the compatibility of various chemicals and alternative fluids to Philmac blue handled ball valves. The mixing together of chemicals may affect the compatibility. Philmac blue handled ball valves are NOT suited for acids. Note recommendations based on fluids at 20°C or less. Philmac offer a selection of spare parts for certain product ranges. Please find below a listing of the spare parts available plus a link for an excel download of this listing. Please note that spare parts are available via all reputable Philmac stockists. *** Kits consist of ‘O’ rings, ball and seal rings. Please find below a complete listing of the Philmac Poly Ball Valves. This is also available as an excel file for download. Philmac offer a wide range of micro irrigation products that include spray jets, drippers, micro sprinklers, valves, LDPE fittings and accessories. The range is ideal for domestic watering, through commercial landscape to horticulture applications. Philmac jets and sprays emit water over short distances and are generally used in garden beds and agricultural applications. Jets deliver streams of water, whilst the sprays offer a 'fan' watering pattern. Philmac offers a range of multi-purpose horticultural and landscape sprinklers in both standard and anti-insect models. A range of flippers is also available for both short and long radius applications. The Philmac range includes the iconic Orbitor and Challenger sprinklers, made in Australia for Australian conditions. 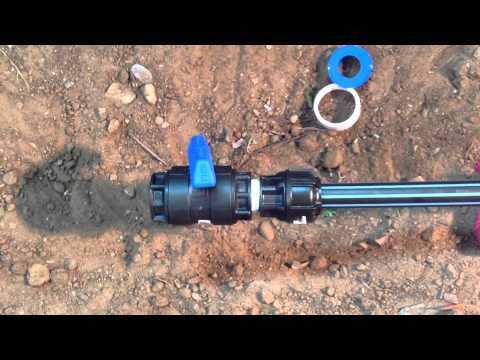 Philmac's range of high quality nylon barbed irrigation fittings and accessories are especially designed to connect low density polyethylene plastic irrigation pipe (or LDPE). The nylon material offers superior performance and maintains the barbs' sharpness to ensure long and trouble-free service in the field. The range is also complemented with fittings, valves and filters which are designed to fit perfectly. The Philmac range of inline valves includes the Testa Rossa barbed and threaded valves as well as the Quick Action Valves (VQA) to make control of water in a micro irrigation system even easier. The valves are ideal for irrigation and horticulture applications such as fruit and vegetable crops or vineyard systems. Philmac heavy duty Tapelock fittings and valves offer quick and easy connections for most brands of 16mm ID (nominal) drip tube and layflat tape products. The Philmac offer a range of pressure controllers, filters, take offs and grommets to help create a complete micro irrigation system. Philmac Pressure Controllers reduce water pressure to a level suitable for garden irrigation systems. Philmac In-Line Filters are suitable for irrigation and rural filtration up to 800kPa. Take-offs are for tapping into garden irrigation pipe, pressure PVC or PE Pipe. Some require grommets to ensure a good seal after installation. There is no video currently available for this product range. Manufactured and used in a number of countries for more than 20 years, Philmac’s micro irrigation range is designed for irrigation installations that require durable high quality components. The range is comprehensive to suit a range of irrigation applications and includes barbed fittings, emitters, drippers and micro sprinklers. Typically these products have been used in domestic gardens and irrigated horticultural applications. Applying water at low pressure and low flow rates over longer periods and more frequently, often daily or every other day. The term "micro-irrigation" refers to drip or trickle irrigation methods using low volume micro- sprinkler or spray devices. The distinguishing feature of all micro-irrigation methods is that they operate at low pressure and target a portion of the plant's root zone rather than the total field area. Converting from conventional surface irrigation to a micro-irrigation system therefore can greatly improve how evenly water is applied over a field and how efficiently water is used. But this potential can only be realized if the micro-irrigation system is carefully designed, maintained, and managed. The goal of any irrigation method is to target water directly to where it is needed, wether that be for a domestic garden, commercial landscape or agriulture aiming to promote consistently high crop quality and yield by preventing drought stress. Since micro irrigation uses much less total water, the water resource becomes less of a limiting factor. In some cases, where limited water sources make sprinkler systems impractical, micro irrigation makes irrigation possible. Since micro irrigation systems apply water at a low rate, tight clay soils are better able to absorb the water without run-off or soil erosion. On sandy soils, irrigation can be scheduled in frequent, small applications to match plant requirement and the soil's ability to hold the water, preventing losses to deep percolation. A well designed micro irrigation system can irrigate crops on hilly terrain where sprinkler irrigation might be impractical. Water amounts, pressure and flow rates are less, with more uniform application to plants (no over-watering). Thus pumps, piping and other components may be smaller and cheaper. Since at least some chemicals can be applied through the system, overall labour costs for fertilizer application may be reduced. And, when fertilizers or other chemicals are applied through the micro irrigation system, amounts needed and costs may be lower. Please check with your local Philmac representative for appropriate chemical resistance. By applying fertilizers on an as-needed basis, micro irrigation reduces the potential for fertilizer leaching into aquifers or running off into lakes or streams. Sprinklers water both plants and weeds. Micro irrigation systems help to control weeds by not wetting between-plant and between-row areas. Disease problems may be reduced because plant leaves are not wetted by the irrigation system. In agricultural applications, since only the plant root zone is wetted, workers have access to fields on firm footing at any time, and field operations can go on at the same time as irrigation. Please find below a complete listing of the Micro Irrigation fittings. This is also available as an excel file for download. Assembled with stake, tube & adaptor. 1 sprinkler, ST05, TO0505 & 0.5m tube.